Before I start yabbering on about design I must mention that my publishers have just told me that my book is being translated into German, French & Spanish so am incredibly excited about that – thank you Germany, France & Spain – that has brightened up my thursday morning no end. So onto the business in hand – creating a stylish retreat takes a bit of work and a big dose of creativity but the good news is it doesn’t have to cost a load of money. By hunting around thrift shops and flea markets you can piece together some fabulous unique finds that make you want to hang out at home and never leave. Suddenly I find myself really into signage and letters – I love how they transform walls adding instant personality. Old letters and signage are quite easy to hunt out on ebay and at flea markets. My sister used some old bus roll signage on her bedroom wall which I adore and I have also just come across a design by Nate Burkus which surprisingly I am rather liking. Mr Burkus’s style is a little too uptight and structured for me but I find myself drawn to the image below. 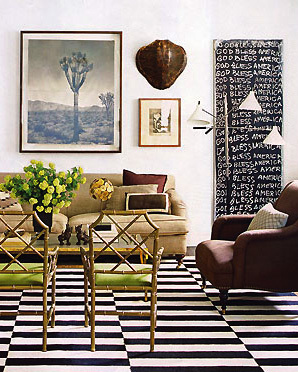 TheÂ painting totally transforms this room and I totally loveÂ the black and white link between the floor and the artwork. Now if I could just paint the walls a colour and unstyle those cushions would totally move in! 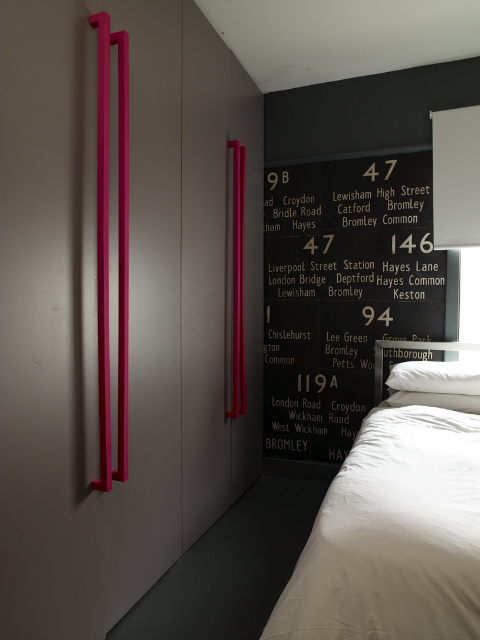 My sisters bedroom and her bus roll signage which she has used as wallpaper – clever, clever, clever (lets not tell her that)!